Keeping you looking great and feeling organized as you leave home, this contemporary hallway mirror features chrome hanger hooks to keep your keychains, car and home keys and even the dog’s leash right where you need it. 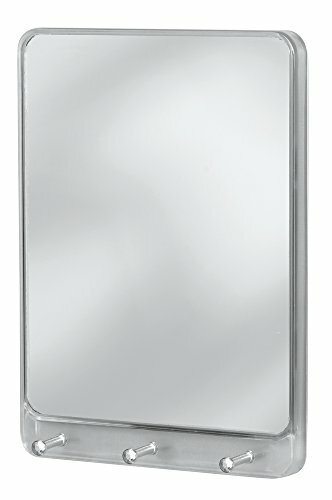 The simple and modern wall mounted storage mirror is made of BPA-free plastic and glass, with 3 sleek chrome organizer hooks along the bottom. Perfect for hanging near the door, in the hallway or foyer, the key storage mirror can be placed at exactly the right height for a quick glance before you leave home. Attractive and functional, the mirror key holder rack can be installed quickly and easily, and all wall mounting hardware is included. InterDesign’s creative products enhance your décor, turning simple home solutions into must-have accessories that shine. Designed in the USA, we are proud to produce a wide selection of high quality home, bath and storage solutions that excite, inspire and charm. Stylish, functional and affordable, our products have been enriching customers’ homes for over 40 years. InterDesign: innovative products, exceptional value. This entry was posted in wall mirror and tagged Clear/Chrome, Hallway, Hanging, Hooks, InterDesign, Linus, mirror, Mount, Organizer, Rack, wall.